Note of 2 June 2013: Be sure to scroll down to the comments section where a reader has provided more information on the life and family of John W. Graffam. 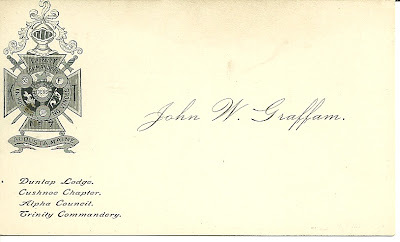 Calling card of John W. Graffam, who belonged to the Trinity Commandery, Dunlap Lodge, Cushnoc Chapter, Alpha Council of Augusta, Maine. From online research, I believe this is the John W. Graffam who lived in Augusta, Maine, per the 1900 Census, and in Winthrop, Maine, per the Censuses of 1910 and 1920, and was the plant engineer at the Augusta Water Company. He described himself as widowed on the Censuses from 1900-1920. I haven't yet been able to find him, definitively, in the 1880 Census, which would have been nice, as it would have shown his two sons and maybe even his wife's first name. It's possible that he's the John Graffam shown on the 1870 Census of Cumberland, Maine, the son of C. P. and Elizabeth Graffam, with a pile of brothers and sisters, but I can't be sure. He had two sons, Bernard Clement Graffam, born in Maine 8 February 1877, and Augusta Leon Graffam, born in Maine 27 January 1879. Bernard married Helen J. Dewyea of Portland on 28 June 1911. Augustus married Alice Eugley of Augusta on 31 October 1906. 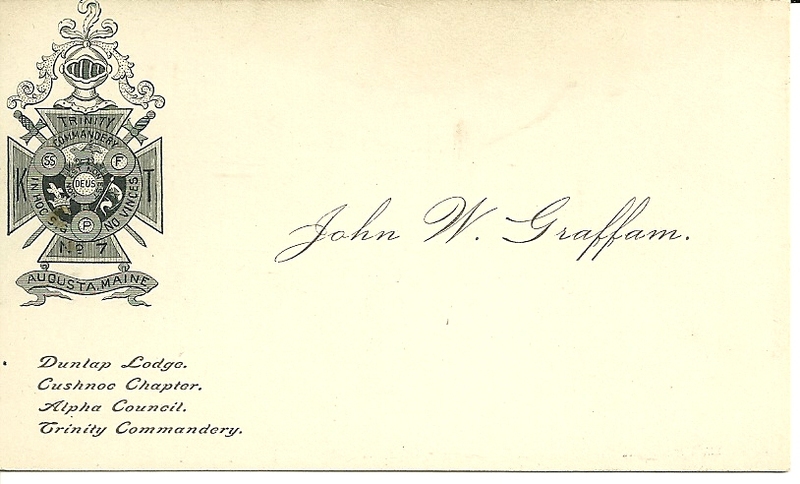 If you have any corrections, additions or insights regarding the above information, especially if you think I have the wrong John W. Graffam, please leave a comment in the comments box or contact me directly. I just love the old calling card tradition. Some of the 1800s ones are very fancy, with beautiful graphics, even some with flaps that you lift up to reveal the name - and everyone had them, even rural folks. There was a lot more visiting in those days. Grace Marie ( 1881-1936) and Alice Maud (my grandmother 1887-1969.
cancer. Lucy and John and the two sons are buried in Portland Vaughn Street Cemetery and you can see their stone on Find A Grave. childhood. I also have Lucy's wedding ring which my grandmother gave me. I remember visiting Aunt Helen after Uncle Bernie died. portraits hanging in my home. Elizabeth and her husband and numberous relatives are buried in Gray, Maine. You are correct about John's career. Thank you so much for this additional information! I amended the post to direct readers to the comments section. I'm so glad that your great great grandmother moved in to be a loving substitute mother for your grandmother. If you ever put your collection on a website or blog, please let me know so that I can insert a link here to it.